Never, never, never say die walking the last leg of life’s journey alone on earth. After watching the interview of Marion Jones-Thompson on the Oprah Show here in Singapore today, I was moved to tears as Marion stood out a true athlete and a champion. 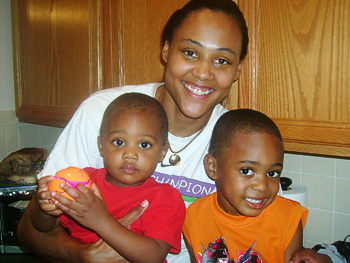 Yes, she went to prison on March 2008 for six months for lying to Federal agents about UNKNOWINGLY taking performance-enhancement drugs during the Olympic Games in Sydney and she had apologised publicly to the world but in my heart Marion Jones will remain the fastest woman athlete. Sadly she will not return to running again. She looks as beaming and beautiful today. Throughout the interview she fielded Oprah’s questions rather matter of factly with occasional tears and I could not, for a moment sense slight of bitterness. Can you imagine living to 130 years old? Meet Sohan Dosova – the newly found treasure of Kazakhstan. She is 130 years old, at least she is according to her documents. The Soviet passport issued in the early 1980s states that Sohan Dosova was born in the Karaganda region on 27 March 1879. Now after a new national census in Kazakhstan, she has been “rediscovered”. “This is a truly unique case,” says Ludmila Kolesova, the head of Karaganda region statistics agency. Sohan Dosova can still walk, albeit with great care, assisted by a walking stick. She eats slowly, and her favourite snack is bread soaked in tea. Sohan chews her food with a single remaining tooth. “My secret is to add butter to my cup of tea; this is how Kazakhs like their tea,” says Sohan, speaking a mixture of Kazakh and Russian. She can still see, but has hearing problems, so most of the communication is done via her granddaughters – and there is no shortage of them. Sohan had 10 children, and three of them are still alive. Her son had seven children. One of two daughters had six children, and the other, 22. “There is a small tribe of great-grandchildren,” says 53-year-old Gulgoim, her eldest granddaughter. But when pressed, Gulgoim was unable to say just how many. Sohan Dosova has lived her entire life in Aul, a village in the central Karaganda region, the industrial heart of the country. Most of the population work in the coal mining industry. Semipalatinsk, the first Soviet nuclear test site, is nearby. Some of Sohan’s grandchildren are mentally ill. They are among thousands believed to have been victims of Soviet nuclear experiments. But Sohan has stayed healthy. “She is in good shape, alert and active,” says Valentina Shamardina, a family doctor with 40 years experience. “In my whole career I never came across cases like this. When I first arrived to do a check-up I demanded to see her passport and it all looked correct. 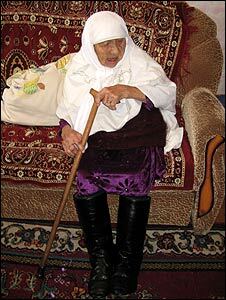 If Mrs Dosova really is 130 years old, that would make her the oldest person in the world. But if she ever had a birth certificate, it no longer exists. 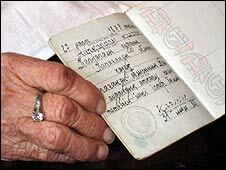 In fact few rural Kazakhs born in those days are likely to have been registered. It was common for people to make up their date of birth. Her true age is simply impossible to establish. 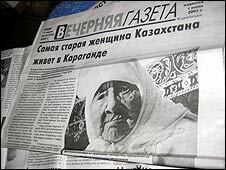 But the local media is satisfied she’s the oldest woman in Kazakhstan. Since the results of the census were made public, journalists have become frequent visitors to Sohan’s fifth floor apartment. Certainly her family appear to be hopeful that all the media attention might result in an improvement to Sohan’s living conditions. But up to now, no benefactor has been forthcoming. So Sohan continues to live a simple existence in her old age, watching television, laughing and smiling. Her granddaughter Nuken claims she loves dancing, but Sohan says she is too old for that now. “I can’t dance, my knees hurt… But I can sing.” And so she gives a gruff rendition of her favourite Kazakh song.